Curious to know what we think of the latest entry in this Tom Clancy based game from Ubisoft? Read on and find out! With 2018 all wrapped up, we here at Rocket Punch wanted to take the time to look back at some of the games that we played throughout the prior year and pick which ones left a lasting impression on us. This list has been written by one of our cofounders, Cameron Kirnes. God of War. Since 2005, the action franchise from Sony Santa Monica has been synonymous with some of the most intense combat and over-the-top boss fights that had even been seen on PlayStation consoles. Through all of its’ three mainline games, and subsequent spinoffs, fans have enjoyed running amok with Kratos, helping him to avenge the betrayals and deceit perpetrated on him by Zeus and the Greek God of Olympus. But since the release of God of War: Ascension in 2013, the series has seemed to fall off most people's’ radars, as newer evolutions and genres in the gaming industry slowly overshadowed God of War and other titles that, at the time, started to show their age a bit by comparison. Now, however, we fast forward to 2018, as PlayStation fans, and gamers alike, have anticipation at a fever pitch for the next installment in the revered series. Things are a bit different, however. Kratos is shown as older and more weathered (with a nifty beard to boot). He is now a father. The setting has shifted from ancient Greek mythos to the dramatically different Norse mythology themes. And the game has no ‘4’ in the title, as people expected, just simply named ‘God of War’, a sign that the series is receiving a reboot, or sorts. By some accounts, people surely questioned if this could work: taking a character from a well-known franchise and flipping all assumptions of them and the game on its’ head. Bringing him back to the front of the gaming industry, after many gamers began to forget some of his harrowing adventures and hoping that he can bring success back to the brand. Changing large amounts of the action-style gameplay to fit a modern, 2018 audience that hasn’t seemed too interested in the genre, leaning more towards open-world settings and scopes. In the end, regardless of potential pundits, we now sit in 2018 with a brand new God of War game, something even I have to admit seemed highly unlikely, with other more established brands taking root in the industry. With Sony Santa Monica, a talented game studio in their own right, putting their best feet forward once again on this franchise, we now have to ask ourselves: does this new ‘God of War’ keep up and stand toe-to-toe with other emerging properties in the industry, or should it remain the ‘Ghost of Sparta’ and recede back to the shadows of the past from where it was derived from? What is God of War? In this latest entry of God of War, we are treated to a different Kratos in a VERY different world from the extravagant structures and war-torn country sides of ancient Greece. Years after the events of the last God of War, we now see Kratos settled within Midgard, living out his life in peace with his newfound family. 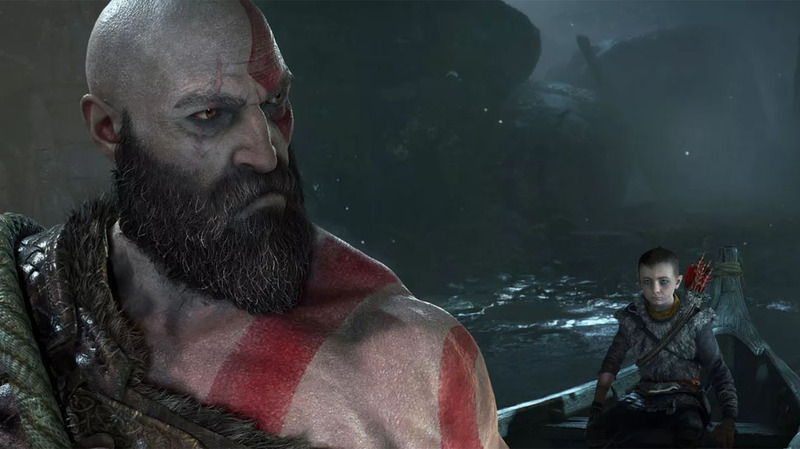 But, at the start of the adventure, we already are introduced to large changes for these two, as Kratos’s wife, Faye, has passed away, and he is left to take care of his young son, Atreus. Their objective together, and the main driving plot for the game, is to carry his wife’s ashes atop the highest mountain. 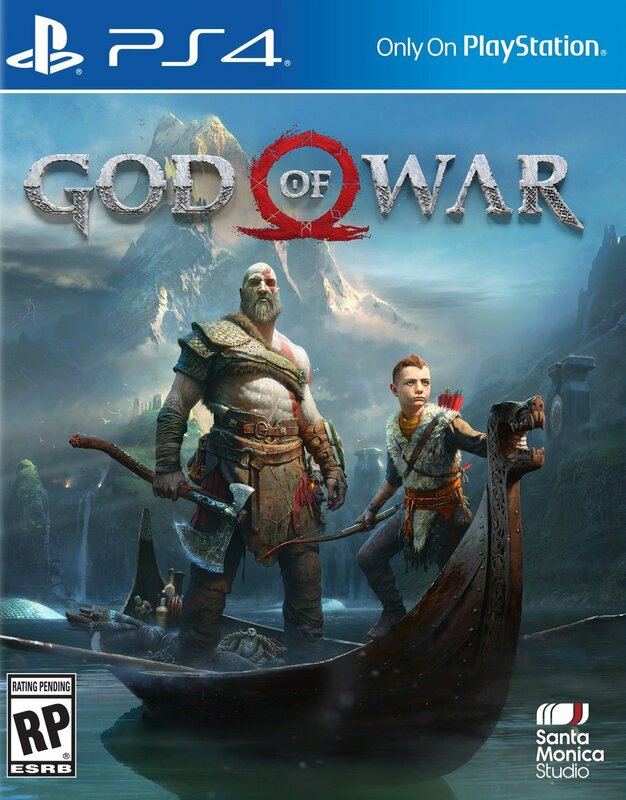 But, as with anything involving Kratos, things do not go as planned, as his dark past in Greece comes back to haunt him and subsequently, places himself and Atreus in danger along their long and arduous journey. The story is one of the biggest standouts of the game, mainly because the game actually HAS a well-paced, fleshed out story. While, yes, previous entries in the series did have a story to help guide and motivate players, it always felt as though it was a backseat to the main feature: playing as Kratos and fighting as many enemies as you can. With this version, it seems Sony Santa Monica has truly made the story one of the game’s strengths, instead of a backdrop, weaving an evocative tale of parenthood, growth, and redemption. I am not a father, but I am a son, and watching the interactions between Kratos and Atreus during their adventure really brought back a lot of memories from my own childhood and interacting with my father (but not in the monster slaying, mountain climbing kind experienced in the game). Multiple moments throughout the story, watching the relationship between them grow and change really (REALLY!) had me in tears, and that was something I did not expect from this game. The trials between just them two kept me intrigued each step of the way, showcasing a tale of parenthood not really seen in other games, but feels so relatable that I would imagine a lot of gamers could draw some correlation with themselves in some way by the end of the story. The developers did a wonderful job showcasing the dynamics between the two, and as a result, really gave Kratos new layers to his character that we have never been treated to. No longer is Kratos just the loud, eccentric, mass of godly muscle yelling “Bring Me Another!” and looking for his next challenger to slaughter, but is presented as a calmer, and wiser figure: still the Kratos everyone knows that can beat the crap out of any threat, but also one who does not go looking for a fight, and battles only when necessary. 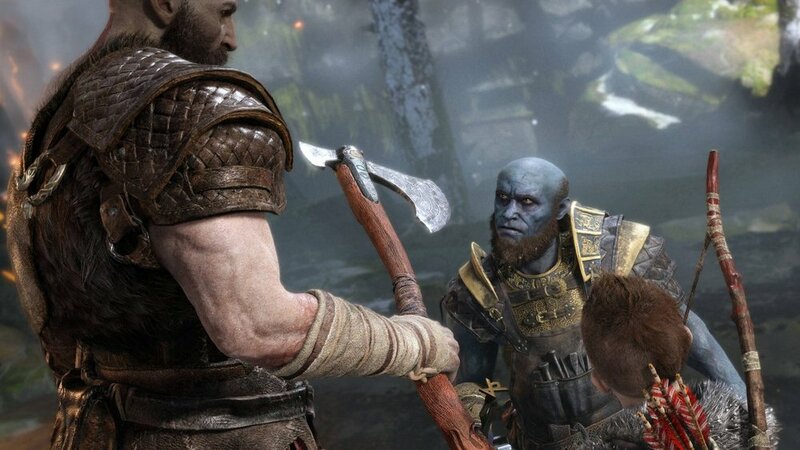 With the addition of Atreus, it gives a different presentation of Kratos that, in my opinion, really hasn’t been seen: that he has a “weakness” that can be exploited. Before, Kratos had nothing to lose, as his wife and daughter were already dead and all he fought for was vengeance against those that wronged him. But now, Kratos has something to lose, and his intensity is shown to change at the snap of a finger, especially when Atreus is threatened. Again, it really helps to open Kratos up as a character, and something that I have to say was very refreshing to see. One of the concerns I had going into the game was wondering if Sony Santa Monica realized that gamers are not looking for just great action games with a small plot line on the side to guide them along, and that in 2018, they need a strong narrative to present complex, yet real, stakes and moments that gamers can relate to, and it feels great seeing that the developers were able to realize that and show off a familiar Kratos, but one who is different as well. But not only did Sony Santa Monica not stop with “rebuilding” Kratos, they did an excellent job with creating a wonderful and diverse cast of characters that Kratos and Atreus interact with throughout Midgard. Usually with open world games, some characters tend to feel throw-away, just additions made to help get you from Point A to B. But here, every character you meet feels meaningful to not just Kratos and Atreus, but also the overall story. Sure, the dwarven brothers Brok and Sindri are used to help upgrade your gear throughout the game, but for many times during my playthrough, I saw myself waiting for the next side quest from them, just to hear more about the stories they have and learn more about their dynamic with each other. Even on the boat headed between points on the map, I found myself sitting and waiting not only for the next dialogue to come out and listen to more of the story and history of the land, but also for the comments (often times hilarious) made between Atreus, Kratos, and others along their path. With characters met on side quests, even their stories have some sort of tie or lesson back to the development of Kratos and Atreus as characters, and it made them worth checking out to see how they affect them, instead of just speeding through the main storyline looking for the next big plot hook. It is rare for me to feel that in an open world game, even supporting characters are more than just fixtures within the world to help the player, but I feel that the developers did a fantastic job making every character matter within the world, and present more than enough reasons to walk off the beaten path and explore more of what the world can offer. With all the above being said about the settings, story, and characters, the one thing that brings fans of the series back every time has been the combat, and once again, the developers have outdone themselves. God of War has always been an action game, chaining hits against a horde of enemies and adding some over-the-top Quick Time Event (or QTE) moments throughout, and it feels as though the developers have taken the combat and evolved it to fit in 2018: still with some flairs of the original combat, but with new additions and improvements that make it enjoyable to play and hard to put down. One of the main changes lies in the fact that Kratos no longer wields the iconic Chaos Blades in battle. The player now uses the Leviathan Axe as Kratos’s main source of bloodletting, and it is a welcome addition to the game. Any fans of Thor and Mjolnir out there should get this game just on the notion of the Leviathan Axe, as it is the best vision of how that relationship would feel in a video game. Nothing quite feels better in battle than to throw the axe to freeze an enemy in place, use Kratos’s fists to beat up on some unsuspecting foes, and then recall the axe back to your hand to deliver the finishing blow. This mechanic also helps to make creating combos fun and inventive, as enemies can take damage when the axe is thrown and when it comes back (if they are caught in the return path). Couple this with some of the runic skills you get throughout the game (like Ivaldi’s Anvil), and once you get the hang of it, you can become a force to be reckoned with, regardless of how many enemies are thrown your way. Another great addition to combat comes from possibly an unsuspecting source: Atreus himself. In battle, you can press the Square button to have Atreus shoot his arrows as targeted enemies. At first, this may not prove helpful, but as you power up Atreus with stronger arrows and new move sets along the adventure, he can prove to be an invaluable asset, helping to stun enemies, weaken them to take extra damage, and even staggering them to allow you to finish them off with some of Kratos’s Execution moves, which can (more times than not) help to turn the tide of some tough fights. It was great to see that not only does Atreus help in the story, but in combat, he adds a great value to upgrading him and utilizing him properly, instead of him being controlled by the computer throughout the game. This also helps prevent Atreus from feeling as though you have to “babysit” him during fights, as a large amount of other games have done in the past (looking at you The Last of Us). These two additions alone helped make me feel rewarded in fights but add along the upgrading of armor and addition of runes and gems to augment abilities, and it really made me spend that extra time to tweak my gear to make sure I get the most out of it before big fights. Also add in the different enemy variations you come across, and the different methods you have to use to take each type out, and some fights can prove challenging to get through. Some enemies are immune to the Leviathan Axe, forcing you to use bare hands to take them down, while others take more damage from Atreus, allowing you to plan the right moment to land an arrow hit to stagger them and land a finishing blow. The only complaint I might have for the new system is with the controls. As a longtime gamer, I have gotten used to using the face buttons to perform attacks. But here, you are by default set to use the shoulder buttons to attack and execute combos. It takes a little getting used to, but as the story progressed and new skills opened up, it made sense why the buttons were mapped to where they are, and by then, I had gotten used to it so much that I didn’t want to change the setup. You can change the control setup if you are used to using face buttons, which is always a nice option for gamers that can’t get past this, so this is a small thing for me, but something worth noting. If you were concerned that, as a God of War fan, you would have some issues with the new combat system, then it should put you at ease to know the system still stands as a hallmark for the series, and then some. So much more of this game has impressed me in more ways than I initially thought they would. I haven’t really talked about it yet, but the open world has been well executed here. The game does a great job of pacing you within smaller areas first and presents the entirety of the world when it feels right, once you have gotten used to combat and exploration. Riding on your boat across the water while tall, snow-capped mountains of Midgard play backdrop to the environment, among other things, really help to bring the world alive and help to invite exploration. Too many times I might see something in the distance and go check it out, just to find a hidden cave and a new side quest. The implementation of the world itself does not feel new compared to other titles, as the way the world is broken up did remind me in particular of the latest Tomb Raider games, but it does feel different being in a God of War game, as I was used to following a linear path as in earlier titles, so it is great to see that Son y Santa Monica did a great job creating the world and making it fit within the God of War mythos, as well as making everything feel alive and landmarks feel meaningful once you interact with them. Another impressive aspect revolves around the single shot camera used throughout the game. From the first time you press Start, to the rolling credits and after, the camera pans around Kratos and rest behind him through the adventure and never cuts away once. There are no loading screens (except when you die) and the camera doesn’t change aspect to other characters during playthrough, and that really adds an extra layer of cinematic value to cutscenes in the game. It really kept me focused and involved when large story beats rolled on and adds to the story in ways that were very appreciated. Again, for a series that traditionally doesn’t care about the story, it feels nice to see that a lot of care was built to help showcase how well the story and events are executed, and the camera implementation reinforces that. At the start of this review, I asked if this new God of War can stand in line with other games on the market in 2018, or will it remain stuck in the past too much to make a difference. Honestly, my answer to that is neither. This entry surpasses them by a large margin. I fully expected the combat to excel, but when you add in the new and improved changes to the action, along with an impactful and meaning story, wonderfully crafted open world, relatable supporting cast, and more, my expectations were sent all the way to Valhalla. I never expected to have as much fun as I did with the game, and that was a wonderful surprise to have. I have beaten the main storyline, but I still find myself craving to go back and explore more of the world, finish more side quests, improve my gear, and throw that damn as many times as I can into as many enemies as possible, and that is a rare feat for a game to invoke after completion. After where this property was at before, Sony Santa Monica should be applauded for the feat they have achieved in bring Kratos back in 2018, more relevant than ever. I can safely say that this game resides in line with other PlayStation essentials like Horizon: Zero Dawn, Uncharted, and others of similar caliber, and allows Sony once again to add another feather in their cap of stellar exclusives. If you own a PlayStation, you should own this game, period. If you don’t think so, then just go and throw that Leviathan Axe one time and recall it back to Kratos’s hand. That alone should change your mind. We are so excited to show you what we are doing. Be sure to check out what new titles you will be able to get your hands on this month, in the latest New Game Releases for May! We're ready to move past energy drinks and candy bars. We're all grown ups, so lets run games coverage like grown ups. We're moving 100% of our focus to building our community and Patreon. Check out some of the latest games coming to consoles and PC near you this month! March is set to be the busiest month for gaming in 2017. From the Nintendo Switch launch, to Mass Effect's return, March is ready to rock our socks off and empty our wallets. Ready to see the exciting new games coming to us in February? Then check out our New Game Releases list to see what deserves your hard-earned cash. The holidays are over, but that doesn't mean we don't have any great games coming our way! With a new year, brings new experiences, and this January is no different! It's a quiet month, but there are still some entertaining titles to pickup (Yes, even THAT one game, too!). Come check them out now! After some good Thanksgiving eats, one of the members from the Rocket Punch crew sits back and reflects on video games as a whole for him, and why he is truly thankful for having them in his life. With the anniversary of this awesome MMORPG upon us, one of the Rocket Punch crew decided to reflect on some lessons he has gleamed from his time in Azeroth. Make sure to save up as much money as you can, because with all of these games releasing this month, your wallets will need some time to recover! Rocket Punch is extremely excited to be participating in Extra Life 2016. This annual event is an amazing opportunity to help children's hospitals across the U.S. while showcasing our love for gaming. Prepare yourself! Some of the games you have been waiting for the entire year are finally headed your way this month, on New Game Releases for October 2016!